Recorded on 26th February with British Pie Week just days away, it was no surprise that BCfm were champing at the bit to get a Piefessional on the air waves! Or more precisely, chomping on the pies! For with Pierateer RAS signed up to feature for an hour on the award winning local radio station in Bristol, presenters Catherine and Alex had lined up local Butcher Peter Molseworth to bring in some of his pies for a live pie rating! 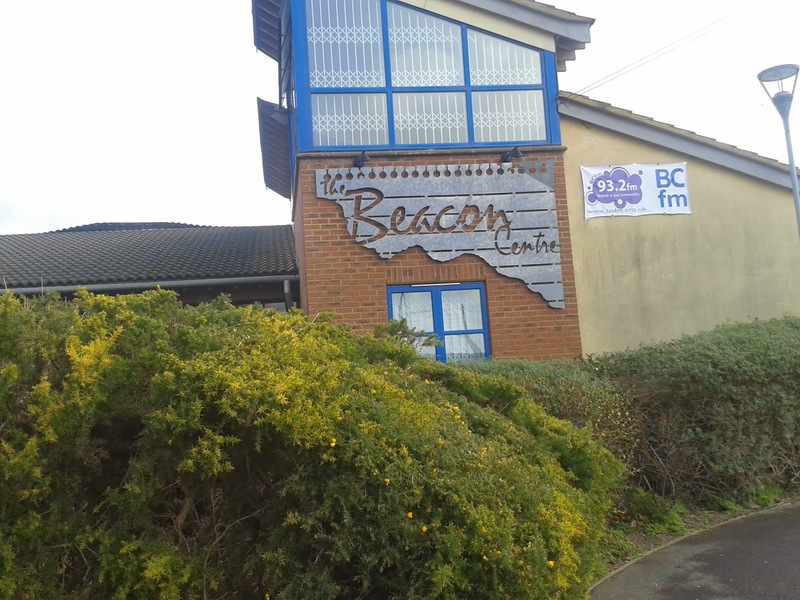 You can listen in to the hour of pie chat by visiting www.bcfmradio.com/food and listening in from 1pm on the 26/2/14 show! 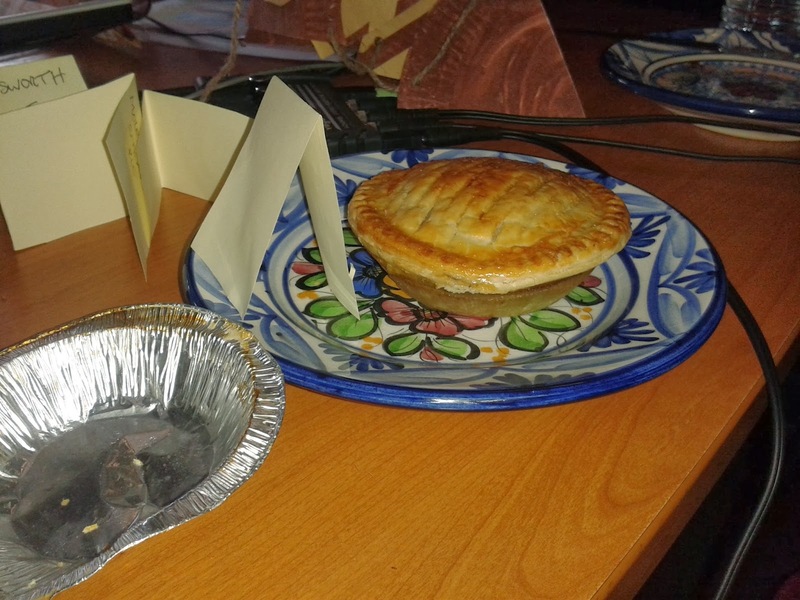 Pierateer RAS made his British Pie Week #PiePledge commitments live on air and Pierateer SJL phoned in to explain his #PiePledge to eat pie every meal of British Pie Week! Peter of Molesworth of Henleaze informed us that pie is at the heart of their business – and quite literally the heart of their Butcher’s shop logo! – with a pie surrounded by wild animals. One wonders why those animals aren’t in the pie too but there certainly was plenty of animal in the pies we rated! One of the advantages of eating a butcher’s pies is that the meat comes straight from the animal, into the pastry and into your hands! We sampled 4 pies in the BCfm studio and started with the Lamb and Leek pie. This was an individual pie for just £1.40. While slightly small for an individual like myself, I thought this was an excellent price for the size of pie. This pie therefore scores very well on cheapness, as the pie contents was some very tender lamb meat. It could have been slightly more full, but let’s not forget lamb isn’t the cheapest meat and you get quality meat in this pie. The leek flavoured the pie but certainly didn’t leave you feeling lacking in meat content. The gravy was nice, a little runny but flavoursome, and the pie was a good golden colour. The pastry was good – not too thick but held together well. If being picky it could have been a bit crisper but all together a very enjoyable pie. The Steak and Gravy pie was even more packed full of meat than the lamb pie! Again great quality meat and a lovely gravy, this was my favourite of them all. £1.40 is a bargain for this pie – I’d definitely buy two for my dinner and still only be paying £2.80! Amazing! The steak was lovely and tender and the gravy was good too. Surrounded in a light pastry, this was another very good pie and just meatilicious content to sink your teeth into. The Celtic Mowbray Pork Pie (made in the style of a Melton Mowbray pork pie but not able to be called this due to not being produced in the right geographical area) was a very nice pork pie. 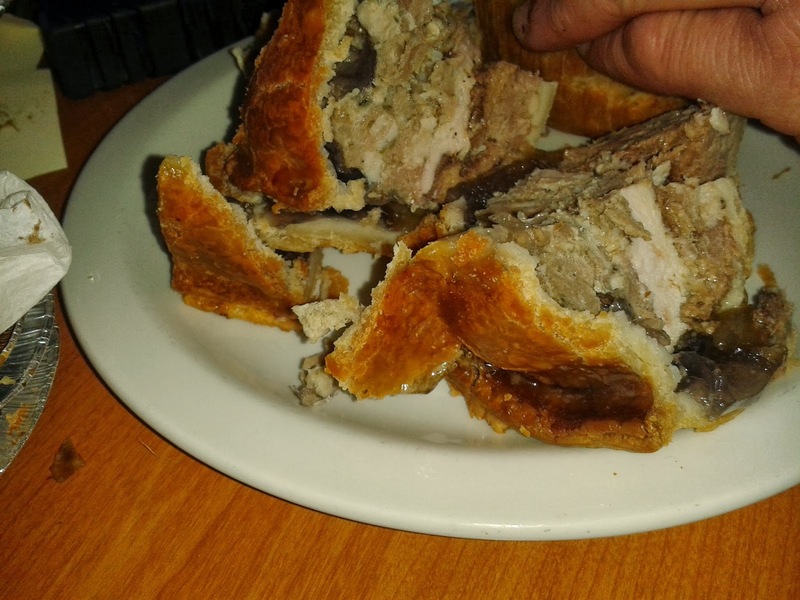 There was plenty of good quality pork meat in the pie, which was well flavoured with sage, salt and pepper. There was quite a bit of jelly present, to keep the filling of the pie moist. This did mean the crust wasn’t quite as firm as I may have liked and it did crumble slightly, but the meat in the middle was very good quality. At £2.99 for a decent sized pork pie, this is quite comparable to supermarket prices but all handmade on site by the Butchers. Finally, the Game Pie was a cold, picnic pie very similar to a pork pie in nature but containing an incredible array of animals! The highlights are the Partridge and Pheasant, shot and prepared by the Butchers themselves. However this pie also contains pork, chicken, ham, red wine to marinade it, juniper berries, cranberries and Bristol Five Spice. This pie really does have a great array of flavours within the pie and while there is a mix of meat, sweet and spice with the berries and five spice, it is a very good flavour. I guess the challenge of a pie like this is that there is so much going on flavour-wise that it can be a bit harder to sample and enjoy all the meat flavours, but the pie is well layered, with quite a bit of jelly to keep it moist. It does crumble a bit when cutting and with quite a light, fluid jelly layer (compared to some pork pies that have a more solid jelly layer) the cut up pieces don’t always hold together perfectly (but that’s an issue with using jelly, not the butchers!) At £5.99 for a decent sized pie with game in, I think this is quite reasonable. I would probably see it particularly as a special occasion pie to enjoy. All in all, great meat and top pies from Molesworths of Henleaze, Bristol. Two Pierate Recommended and two Pierate Highly Recommended pies! Great work!